Stat of the day: Trainer Rudy Rodriguez, who has won a ton of races at Laurel in the last few years, is 0-for-20 when shipping a horse who hasn’t raced in 61-120 days to Laurel. He’s doing that with #3 Stay Good, the 9-5 favorite in race 8. The Saturday card starts — oddly enough — with four consecutive $8,000 claiming races (albeit with varying lifetime, beaten, or open conditions). The favorite in this one is #5 Tambora (2-1) who pressed the pace against better in his last before fading to sixth. But we’ll try to beat him with the runner-up from that race, #1 Port Louis (5-2), who ran a huge one at long odds despite a bit of trouble. Whether he can double up good efforts — or whether he’ll get the pace he wants to run into — remains to be seen, but a repeat of that last should be enough here. 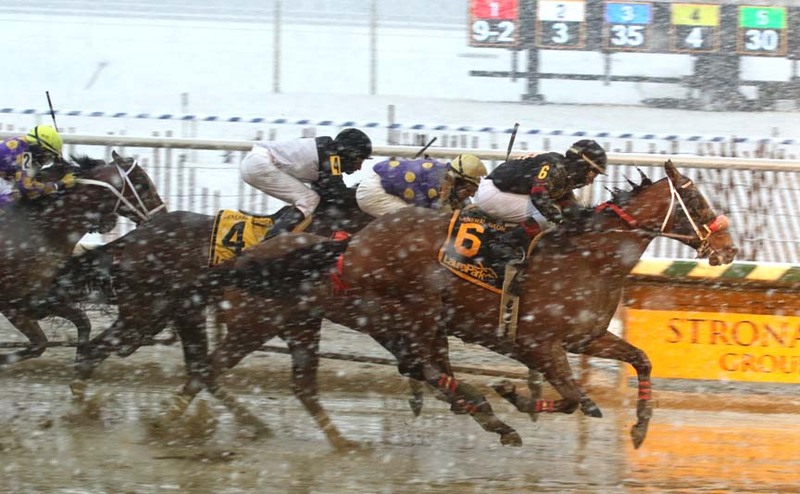 This never-won-two tilt is a bit of a mixed bag: some not-very-accomplished older horses and some lightly raced sophomores that need to improve. We’ll grab one of the latter as our top choice. #7 Rouxhere (5-2) makes his first start in the Wayne Potts barn (16 percent with a nearly-break-even ROI first in the barn) after a couple of recent so-so tries against higher-priced sophs. He drops down here, and if Pott can get him back to the form that saw him break his maiden for $30,000, he can win in this spot. Sheldon Russell is up. Three-year-old fillies square off in this one, and our top pick here is #3 Flirtation Walk (6-1). This miss broke her maiden last out, so the lightbulb theory could be in play; that day she sat a good trip off the speed, and she might find the same sort of trip in this spot, with #1 Allison K (3-1) and #7 Wild Type (10-1) both figuring to be forwardly placed early. The favorite in here is #4 No Refunds (9-5), whom you can’t ignore after she galloped against similar last out. But she was a vet scratch two weeks back when she was entered against better and now returns to this $8,000 level — a bit of a concern that may prove to be nothing but makes the likely short odds unappetizing. Nice effort last out by #9 Angelinas Star (7-2). She dueled for the early lead, dispatched her speed rival, and went on to a couple-length win. The runner-up from that tilt, Dear Charlotte, followed up with a victory, validating this one’s effort. Drawn outside for the second straight start, rider Xavier Perez can put her on the lead or just off it, as he prefers, at a distance at which she’s been in the money six of seven tries. She’ll have to contend with, among others, the class-dropping #4 Thesweetesttaboo (8-5) for trainer Claudio Gonzalez; that runner has been facing much better without notable success but looks likely to appreciate getting back to a short sprint here. On best, she’ll be a handful. Bottom-level maidens square off in this contest, and we’ll take #6 Gaby Vee (3-1). The Temple City filly makes her first start in trainer Claudio Gonzalez’ barn. Last out, against similar, she hesitated at the break, costing herself a few lengths, before running willingly enough to be third, which would have been second had she broken better. A runner worth a look at a perhaps more enticing price is #10 Bonnie Kate (6-1), particularly if rider Kali Francois can work out a clean trip from the outside. In her debut she had to tap on the brakes a couple of times in the early going, and this one stuck with it to be third; winner Gateau St. Honore returned to be runner-up against better, and three of six to run back have finished in the money. There’s plenty of early speed signed on for this second-level allowance, which raises the question: which runner will pick up the pieces? We settled on #5 Velocita Brillante (7-2). This runner has been in very good form her last several, before and after being claimed by Claudio Gonzalez, having had her three-race win streak snapped last out when running decently in the Conniver. She figures to lag well off the early pace, but with the inside three posts occupied by horses who like the front, she should have plenty of speed to run into. Whether 5 1/2 furlongs will be too short, however, remains to be seen. Another who makes a lot of sense in this spot is #6 Souper Echo (3-1). The Mike Trombetta trainee can get back to better form with blinkers peeled off again here, but the mark against her is the five losses she’s compiled at the level. It’s maidens in the seventh, and on paper, two of these look to be a handful: #1 Closer Look (8-5) and #2 Marylander (9-5). They ran in the same race on debut, finishing third and second, respectively. Of the pair, we’ll give the nod to Closer Look; trainer Graham Motion hits at 17 percent with second-time maidens (versus 1-for-27 for Rob Bailes, trainer of Marylander), and Closer Look seems to have had the worse of the two trips. Most of the winners that day came from the two- to four-paths, while Closer Look was down on the rail. A horse we’re intrigued by at a price is #6 Junior Jumper (20-1). This runner has shown pretty much nothing to date running for Kelly Breen. But trainer Mary Eppler evidently bought him privately, had him gelded, and now shows up in much better company. Why? No idea, but Eppler’s a solid trainer, this one’s been firing bullets in the morning at Pimlico, and what the heck, the price is right. Our stat of the day is a negative one (above) and it pertains to the favorite in here, #3 Stay Good (9-5), who isn’t, particularly, but more than fits with these. The red flags are a concern, though, not just the statistic but also that this one was beaten just two lengths for $16,000 but here drops in half in just her fifth career start — not really a vote of confidence. We’ll take a stand against and try to beat her with #8 Call Me Jelly Roll (3-1). The Jerry O’Dwyer trainee finished third last out against better in her first tilt against older runners and certainly looks competitive against these. Let’s try to get out of the day with a bang, with #5 Princess Rosie (20-1) springing the upset. This one has been in terrible recent form, but a return to her first couple of races would put her right there with these in a race without much other early speed. That’s more appetizing than the favorite, #2 Midnight Mass (2-1); the Charlie Lynch trainee is way too well-bred to debut for $10,000 — she’s by Midnight Lute and is the first runner out of a Grade 3-placed Macho Uno mare — which makes you wonder. If she wins, she wins, but this doesn’t feel like a race when you want to take 2-1 on a firster.